Our One Dozen Ultimate Roses are the perfect gesture when nothing but the best will do. 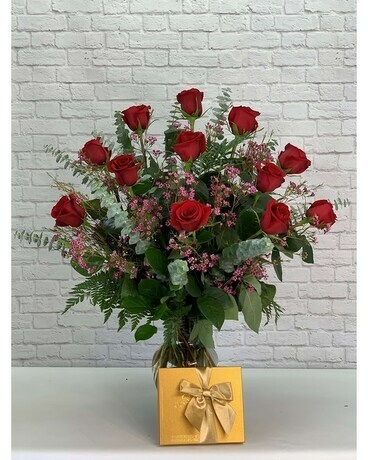 A dozen of our longest-stemmed premium red roses are expertly arranged alongside eucalyptus, lovely accents of wax flower, and premium seasonal greens. This bundle includes a large box of Godiva Chocolates. Approximately 27” tall by 23” wide. Available for local delivery only.